These are ultrasound tests that are used to that look at your heart muscle function and heart valves. In a Transthoracic ECHO, a cold jelly is placed on the surface of your chest then a wand is rubbed across your chest to produce images of your heart. This is a non-invasive test and no special preparation is required. You will be asked to exercise on a treadmill and at the same time an electrical tracing of your heart will be performed by ECG, see above. This test will look for changes in your ECG. No special preparation is required for this test, however you should wear comfortable shoes. Similar to the stress test above, however an ultrasound of your heart is performed to look for abnormalities in your heart’s muscle function. An abnormality may indicate a heart problem. If you are not able to exercise for this test, your health-care team may suggest the use of a medication to make your heart act like it is exercising. A dobutamine stress echocardiogram (DSE) may be used if you are unable to exercise. Dobutamine is put in a vein and causes the heart to beat faster. It mimics the effects of exercise on the heart. During an echo, a transducer (like a microphone) sends out ultrasonic sound waves at a frequency too high to be heard. When the transducer is placed on the chest at certain locations and angles, the ultrasonic sound waves move through the skin and other body tissues to the heart tissues, where the waves bounce or “echo” off of the heart structures. The transducer picks up the reflected waves and sends them to a computer. The computer displays the echoes as images of the heart walls and valves. • M-mode echocardiogram. This, the simplest type of echocardiogram, produces an image that is similar to a tracing rather than an actual picture of heart structures. M-mode echo is useful for measuring heart structures, such as the heart’s pumping chambers, the size of the heart itself, and the thickness of the heart walls. • Doppler echocardiogram. This Doppler technique is used to measure and assess the flow of blood through the heart’s chambers and valves. The amount of blood pumped out with each beat is a sign of how well the heart is working. Also, Doppler can detect abnormal blood flow within the heart, which can mean there is a problem with one or more of the heart’s four valves or with the heart’s walls. • Color Doppler. 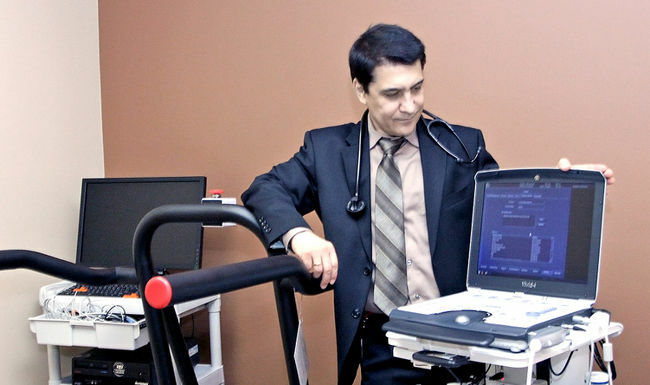 Color Doppler is an enhanced form of a Doppler echocardiogram. With color Doppler, different colors are used to show the direction of blood flow. • 2-D (two-dimensional) echocardiogram. This technique is used to see the actual structures and motion of the heart structures. A 2-D echo view looks cone-shaped on the monitor, and the real-time motion of the heart’s structures can be seen. This allows the doctor to see the various heart structures at work and evaluate them. • 3-D (three-dimensional) echocardiogram. 3-D echo technique captures 3-D views of the heart structures with greater depth than 2-D echo. The live or “real time” images allow for a more accurate assessment of heart function by using measurements taken while the heart is beating. 3-D echo shows enhanced views of the heart’s anatomy and can be used to determine best treatment plan. Spirometry is a common office test used to assess how well your lungs work by measuring how much air you inhale, how much you exhale and how quickly you exhale. Spirometry is used to diagnose asthma, chronic obstructive pulmonary disease (COPD) and other conditions that affect breathing. Spirometry may also be used periodically to check whether a treatment for a chronic lung condition is helping you breathe better. If you’ve already been diagnosed with a chronic lung disorder, spirometry may be used periodically to check how well your medications are working and whether your breathing problems are under control. Spirometry is generally a safe test. You may feel short of breath or dizzy for a moment after you perform the test. • Wear loose clothing that won’t interfere with your ability to take a deep breath. • Avoid eating a large meal before your test, so it will be easier to breathe. A spirometry test requires you to breathe into a tube attached to a machine called a spirometer. Before you do the test, a technician or your doctor will give you specific instructions. Listen carefully and ask questions if something is not clear. Doing the test correctly is necessary for accurate and meaningful results. • You will be seated during the test. • A clip will be placed on your nose to keep your nostrils closed. • You will take a deep breath and breathe out as hard as you can for several seconds into the tube. It’s important that your lips create a seal around the tube, so that no air leaks out. • You’ll need to do the test at least three times to make sure your results are relatively consistent. If there is too much variation among the three outcomes, you may need to repeat the test again. The highest value among three close test results is used as the final result. • The entire process usually takes less than 15 minutes. A Holter monitor is a small, wearable device that keeps track of your heart rhythm. Your doctor may want you to wear a Holter monitor for one up to fourteen days. During that time, the device records all of your heartbeats. This is a non-invasive test that records the electrical activity of your heart. You will be asked to lay flat and sticky tabs will be placed across various areas of your chest and attached to a machine. Overall, the procedure is quick and takes only minutes to complete. You will need to remove jewelry and perhaps your shirt, no other preparation is required. We know when you have an appointment with your cardiologist, there can be a lot to keep in mind. To help your appointment go as smoothly as possible, we have created a list to help you prepare for your appointment. • Make sure to always bring your health card to all of your appointments. • Bring a list of all your current medications (including name, dose, and frequency) with you to your appointment. 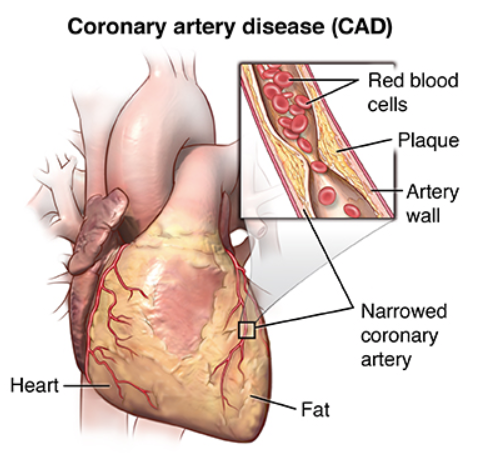 This information is very important for your cardiologist and can ensure accuracy in your medical record. Also write down any medications that you are allergic to. • Write down your family health history. This should include any health issues for close relatives such as parents, grandparents, siblings, aunts, uncles, and children. We want to know if any of any members of your family have been diagnosed with heart disease, high blood pressure, high cholesterol, diabetes, or an aneurysm. A family history, including the cause of death for relatives, can provide clues as to what illnesses/conditions you may be at risk for developing. • If you have them, bring in copies of any recent lab results and any other test results from the past year. This will help avoid any unnecessary extra tests. • Write down a list of the questions you have and bring it with you to your appointment. Focus on the top three or four questions you would like to have addressed during your visit. Even though this might seem silly, it is easy to get sidetracked during a medical appointment. • To help keep yourself organized. Consider putting all this information into a folder so it’s easy to access during your visit. No special preparation is needed for transthoracic echocardiogram. You can eat, drink or take your medication as you normally do. Bring a list of all present medications. Do not apply any body lotion or oil to your skin before the appointment, as this makes it difficult to obtain high-quality images. Prior to the test, you will be asked to sign a consent form. Please read it carefully and if you have any questions, ask the technologist. He or she will explain the entire procedure before it begins. After you have signed the consent form, you will be asked to remove your clothing from the waist up and given a gown to wear. The technician will attach sticky patches (electrodes) to your body to help detect and conduct the electrical currents of your heart. During the echocardiogram the technician will dim the light to better see the video monitor. You will be asked to lie down on an examination table on your left side. In order to obtain clearer pictures, a water-based gel will be applied to your chest. The gel may feel cool but will not harm your skin and will be removed at the end of the test. The technician will move the transducer back and forth over your chest. The sound waves create images of your heart on a monitor, which are recorded for your doctor to review. You may hear a pulsing “whoosh,” which is the ultrasound recording the blood flowing through your heart. Most echocardiograms take less than an hour, but the timing may vary depending on your condition. During a transthoracic echocardiogram, you may be asked to breathe in a certain way or to roll onto your left side. Sometimes the transducer must be held very firmly against your chest. This can be uncomfortable — but it helps the technician produce the best images of your heart. An exercise stress echocardiogram is a test to evaluate the function of the heart at rest and particularly after you exercise on a treadmill in stages. 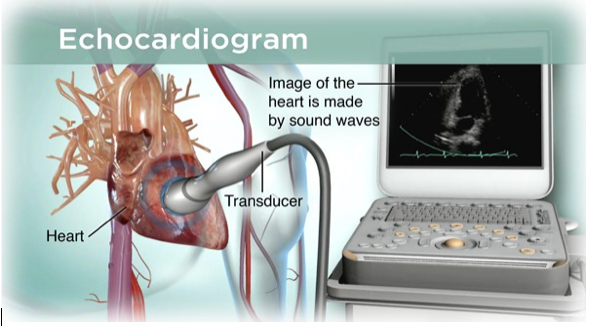 The echocardiogram machine uses ultrasound waves to produce images of the heart and does not use radioactivity. You can have a light meal before the test. • Don’t smoke on the day of the test because nicotine can interfere with your heart rate. • Don’t drink coffee, tea, decaffeinated products, chocolate, soda or take any medications that contain caffeine without checking with your doctor. Your physician may decide to temporarily discontinue certain heart medications prior to the test. These are discontinued because they may offset the effectiveness of the test. Your physician MUST inform you whether to discontinue these heart medications 48 hours prior to the test. DO NOT STOP any medication on your own without checking with your physician. You may resume taking your medications following the exercise test. • Let your doctor know if you take medication to control diabetes as well. • Wear comfortable, loose-fitting clothes. Since you will exercise, make sure to wear good walking or running shoes. Prior to the test, you will be asked to sign a consent form. Please read it carefully and if you have any questions, ask the technician. He or she will explain the entire procedure before it begins. The tests lasts around 60 minutes. After you have signed the consent form, you will be asked to remove your clothing from the waist up and given a gown to wear. Your doctor will need to see how your heart functions while you’re at rest to get an accurate idea of how it’s working. The ECG technician will begin by placing 10 small, sticky patches called electrodes on your chest. The electrodes connect to an electrocardiograph (ECG). The ECG will measure your heart’s electrical activity, especially the rate and regularity of your heartbeats. You’ll likely have your blood pressure taken throughout the test as well. Next, you’ll lie on your side and the echo technologist will do a resting echocardiogram, or ultrasound, of your heart. They’ll apply a special gel to your skin and then use a device called a transducer. This device emits sound waves to create images of your heart’s movement and internal structures. After the resting echocardiogram, you will exercise on a treadmill, which increases its speed and incline in stages. As exercise increases, your heart rate and blood pressure will rise. This is a normal response and they will be monitored along with your ECG. You will be encouraged to exercise until a target heart rate (determined by age) has been reached, because this increases the effectiveness of the test. If you experience any symptoms, at any time, such as chest pain, shortness of breath or light-headedness, immediately tell the staff monitoring the test so adjustments can be made. When the treadmill stops, the technologist will help you on the quick and safe transition towards the examination bed besides the treadmill, to record additional images in less than 60 seconds. An echocardiogram (echo) is a test used to assess the heart’s function and structures. A stress echocardiogram is a test done to assess how well the heart works under stress. The “stress” can be triggered by either exercise on a treadmill or medication called dobutamine. Why might I need a dobutamine stress echocardiogram? There may be other reasons for your doctor to recommend a DSE. What are the risks of a dobutamine stress echocardiogram? • Taking beta-blocking medications – these may make it difficult to increase the heart rate to an appropriate level. How do I get ready for a dobutamine stress echocardiogram? • Your doctor will explain the procedure to you and let you ask questions. • You will be asked to sign a consent form that gives your permission to do the test. Read the form carefully and ask questions if anything is not clear. • Tell the doctor if you are allergic to or sensitive to any medications or latex. • Fasting (not eating) may be required before the test. Your doctor will give you instructions on how long you should withhold food and/or liquids. Tobacco use and caffeinated beverages, such as coffee, tea, and soda, may be restricted several hours before testing. • Tell your doctor of all medications (prescription and over-the-counter), vitamins, herbs, and supplements that you are taking. • If you are pregnant or think you may be pregnant, you should notify your doctor. • Tell your doctor if you have a pacemaker. • Based on your medical condition, your doctor may request other specific preparation. What happens during a dobutamine stress echocardiogram? • You will be asked to remove any jewelry or other objects that may interfere with the procedure. You may wear your glasses, dentures, or hearing aids if you use any of these. • You will be asked to remove clothing from the waist up and will be given a gown to wear. • You will be asked to empty your bladder prior to the procedure. • An intravenous (IV) line will be started in your hand or arm prior to the procedure. It’s needed for injection of the dobutamine and to give you IV fluids, if needed. • You will lie on your left side on a table or bed, but may be asked to change position during the test. • You will be connected to an electrocardiogram (ECG) monitor that records the electrical activity of your heart and monitors your heart during the procedure using small electrodes that stick to your skin. Your vital signs (heart rate, blood pressure, breathing rate, and oxygen level) will be monitored during the procedure. The ECG tracing that records the electrical activity of your heart will be compared to the images displayed on the echocardiogram monitor. • The room will be darkened so that the images on the echo monitor can be seen by the technologist. • The technologist will place warmed gel on your chest and then place the transducer on the gel. You will feel a slight pressure as the technologist positions the transducer to get the best image of your heart. • The dobutamine infusion will begin at a rate determined by your weight. The rate of the infusion will be increased every few minutes until you have reached your target heart rate (determined by the doctor based on your age and physical condition), or until the maximum dose of dobutamine has been reached. • After the dobutamine is started and after each increase in the dobutamine, your blood pressure will be checked, an ECG tracing will be done, and echocardiogram images will be recorded. • The technologist will move the transducer around on your chest so that all areas and structures of your heart can be seen. • Once you have reached your target heart rate or the maximum amount of the dobutamine, the medication will be stopped. Your heart rate, blood pressure, ECG, and echo will continue to be monitored for 10 to 15 minutes until they have returned to the baseline state. • Tell the technologist if you feel any chest pain, breathing difficulties, sweating, or heart palpitations at any time during the test. • Once all the images have been taken, the technologist will wipe the gel from your chest, remove the ECG pads, and take out the IV line. You may then put on your clothes. What happens after a dobutamine stress echocardiogram? You may go back your usual diet and activities unless your doctor tells you differently. Generally, there is no special type of care following a dobutamine stress echocardiogram. However, your doctor may give you additional or alternate instructio0:28/0:57after the procedure, depending on your particular situation. 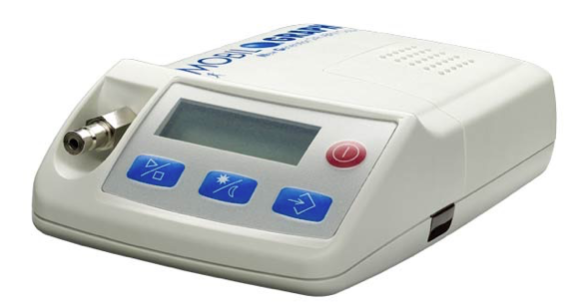 ABPM (ambulatory blood pressure monitoring) – predominantly recording of blood pressure data over 24 or 48 hours – is a recognised diagnostic procedure for evaluating the actual blood pressure situation outside the practice and is mainly used to rule out white coat hypertension and masked hypertension or to assess a secondary form of hypertension. ABPM is an excellent procedure for therapy control if hypertensive patients are being treated with medication. The 24-hour profile is then used to decide what, if any, change is needed to the medication dosage. Blood pressure follows a characteristic circadian rhythm over 24 hours. Lack of a circadian rhythm is an indicator of secondary hypertension.